Here's an update on Jake Bolyard and Zach Wasson's pursuit of 1,000 career points. There's a better than average chance that both will reach the milestone yet this season. Let's start with Jake. He's within 50 points, 49 to be exact according to my stats and stats from the Daily Record archives. He's averaging over 21 points per game on the season. It's very possible that he reaches 1,000 this Saturday, at home, on Senior Night, against Wadsworth. But regardless, he'll get it, barring injury. His 30 point effort against Clear Fork this past weekend was the 2nd time he scored 30 or more this season, and the 4th time he's done it in his career. He's scored 20 or more an impressive 19 times over the past 2 seasons. He just missed being a 20 ppg scorer last year, but barring a complete collapse, he'll do it this year. 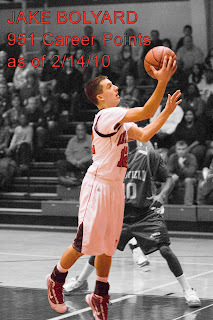 In terms of pure shooters, Jake is one that will go down in Orrville history as one of the best. In recent history, maybe only Kyle Simmons approaches him in terms of ability, but Jake has that rare ability to simply score, be it spotting up, coming off a pick, having a hand in his face or wide open. He practically willed the team to their most recent win over Clear Fork with 15 fourth quarter points. I hope fans turn out this Saturday for the Wadsworth game. Jake has given his heart to Orrville basketball. He deserves some recognition. I thought Zach might fall short of the 1,000 this year and have to settle for doing it very early next season, but that was before he put up his career best 38 against Lexington. He currently stands at 897...and will still likely need the team to win several tournament games for the 1,000 to be in reach, but it's possible. 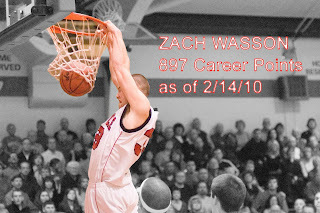 Zach has 306 points on the season, good for 18 per game, up from 13.1 his freshman season and 14.3 last season. Barring injury, he could end up with 1400 points and 600 rebounds for his career. Quite an accomplishment. It's also possible that both Zach and Jake average 20 ppg for the season, something that has never been done in Orrville history. This is the 4th player that you somehow left out! How could that go so unnoticed Tim? The 3 players listed by Andrew were TRIWAY players. You honestly think I'd leave Denson off the list? I can't believe you'd think Benning, Lent and Swisher were Orrville players.